What It’s About: A look at the Space Age and the creation of its myth, beginning with Chuck Yeager (Sam Shepard) breaking the sound barrier in 1947 and ending with the final Mercury mission. Why Watch it Today? : Alan Shepard (Scott Glenn) became the first American to make it into space on this day in 1961. 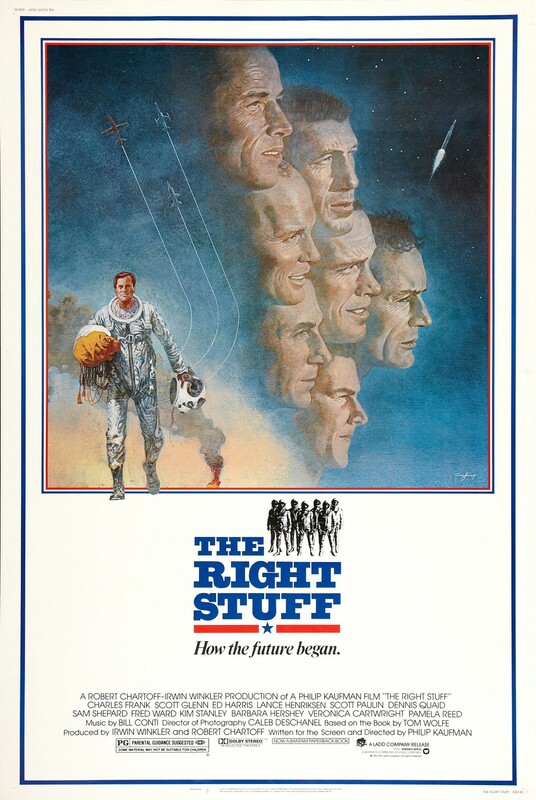 The Right Stuff, based on Tom Wolfe’s mammoth book, is a beautifully shot, fantastically cast film with a great score and a wickedly dry sense of humor. Speaking of the cast…it just happens that it’s also the birthday of Lance Henriksen, who plays astronaut Wally Schirra. Henriksen turns 74 today. This entry was posted in "Based on a True Story", Adaptation, Adventure, Based on a Book, Drama, Epic, Event Film, Movie of the Day, Period Film and tagged astronauts, Barbara Hershey, Best Art Direction Set Decoration Nominee, Best Cinematography Nominee, Best Effects, Best Effects Sound Effects Editing, Best Film Editing, Best Original Score, Best Picture Nominee, Best Sound, Best Supporting Actor Nominee, Chuck Yeager, Cold War, David Clennon, David Gulpilil, Dennis Quaid, Donald Moffat, Ed Harris, Fred Ward, Harry Shearer, Jeff Goldblum, John Dehner, John P. Ryan, Kathy Baker, Kim Stanley, Lance Henriksen, Levon Helm, Mary Jo Deschanel, NASA, O-Lan Jones, Pamela Reed, pilots, racism, racists, rocket launch, rockets, Royal Dano, Sam Shepard, scientists, Scott Glenn, Scott Wilson, sound barrier, space exploration, space race, test pilots, The Ladd Company, The Marines, U.S. Airforce, U.S. Navy, Veronica Cartwright. Definitely an all time favorite for a few big reasons. Those pre-CG effects are still really impressive, as well. I read on the IMDb trivia page that they were the same kind of effects Republic used back in the day for their serials, only done on a much higher budget, which is pretty damned amazing.